The Bagri Foundation Scholarship at The Prince’s Foundation School of Traditional Arts aims to encourage and reward emerging artists visiting from Asia. It supports artists who would not have been able to study in the UK without financial support. The Bagri Foundation Scholar for 2018 – 2020 at The School was Mustafa Ruhullah Muhammad Baqir. Mustafa lives in Indonesia and is originally from Singapore. He currently works as a graphic designer and photographer. Mustafa is very interested in the perennial philosophy and Islamic mysticism, stating the “beauty of art has a deep influence in the spiritual life”. Read more here. Bagri Foundation Scholar for 2017 – 2019 at The School was Karma Lama. Karma is of Nepalese nationality and was brought up in a Buddhist monastery. Both his brothers and uncle are Buddhist Monks. In Nepal he studied traditional Tibetan art cultures, in particular the rituals encompassed in thangka paintings. Read more here. In 2017, we were also proud to present the Bagri Prize to two outstanding MA students practising Asian arts at The Prince’s Foundation School of Traditional Arts from 2015-2017. 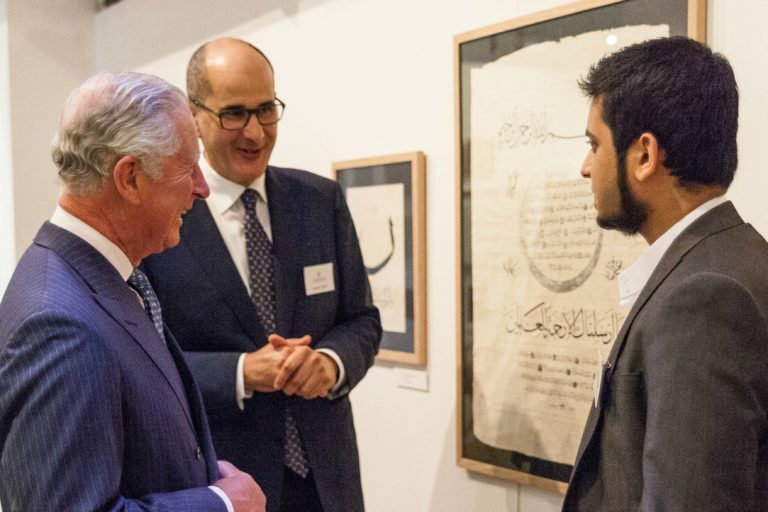 O n 5 July 2017, HRH The Prince of Wales attended The Prince’s School of Traditional Arts’ annual degree show and awarded the new Bagri Prize to Martha Moderitz and Muhammad Samiur Rahman. Martha’s paintings reveal her love for dance, geometry, nature and Pahari Miniature Paintings. Muhammad’s work is inspired by Islamic calligraphy and theology. Read more here.